Do you feel like you struggle to keep your home tidy? Do you sometimes wish your house was bigger so you had more storage for all your stuff? If you answered yes to either of these questions, then the KonMari Method might be for you. 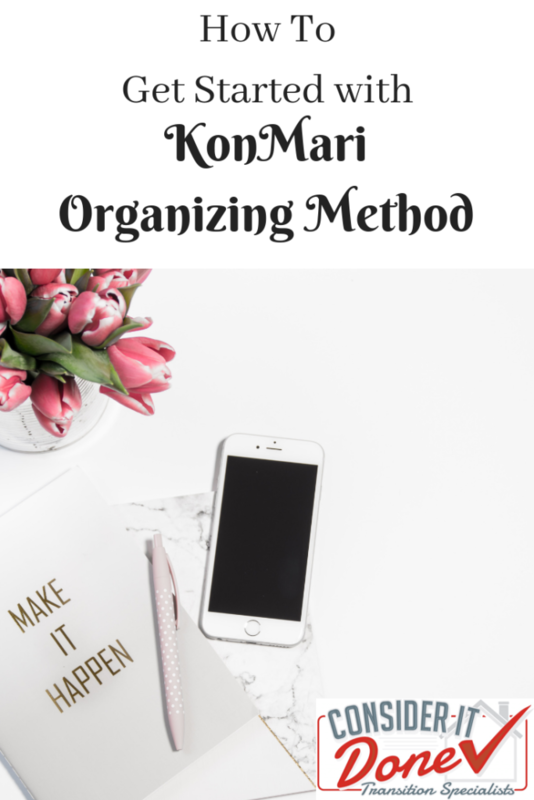 If you haven’t heard of this method of organizing and tidying, then don’t worry, I’ll introduce it to you now! The KonMari method is a professional organizing technique that became popular after Marie Kondo published her book ‘The Life-Changing Magic of Tidying Up’. While there are those that follow the methods described the in book rigidly, my goal here is to outline the elements that I believe are most practical to implement. Following these strategies will make it much easier for you to keep your home tidy. And if your home is tidy, it will become a place you are happy to spend time in. The first step to a tidy home is not tidying more. And it’s not buying a bigger home with more storage. It’s having less unnecessary items that make your home untidy. In order to make this method work for you, you need to commit to letting go. Imagine how much happier you will feel living clutter-free! The KonMari method encourages tackling decluttering in one go as a special event, rather than it be an on-going chore. This may be impractical for some, so find something that works for you. If you can’t dedicate a day to the event, then perhaps picking a category a week over a few weeks might be more feasible. Whatever you choose, set yourself a goal with a specific end date to complete your decluttering activity. Rather than decluttering by room, the KonMari Method proposes decluttering by like things. This will ensure that you declutter thoroughly and completely. For example. when tackling towels, get all the towels from all the rooms in your home and eliminate what you don’t need. 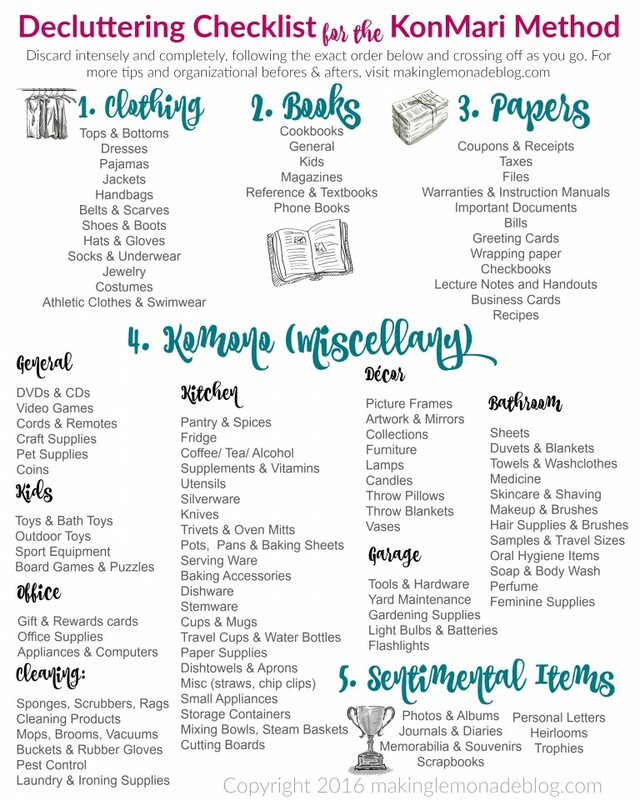 Here is a lovely free printable from MakingLemonadeBlog.com that will help you work your way through the home. Does it have a designated place? Asking yourself these questions should allow you to declutter quickly. Even if the item was a gift that you’re holding onto out of guilt, you will recognize that you’ll feel better for letting it go. We often hold onto items for many reasons – from guilt, to sentimentality, to the idea that we might possibly need it in future. Get used to the feeling of letting go, and know that letting go is a good thing. In the end you will reap many more benefits from letting go of something than holding onto it. With less things in your home, you’ll have a space you enjoy being in, and spend less time tidying. In order to maintain your tidy home going forward, it’s important to stem the flow of new clutter coming into your home. Keep the questions in no. 5 in mind before you bring more things into the home. Only if you really need or love something should you purchase a new item. As the saying goes, “A place for everything, and everything in it’s place”. Make sure you have a suitable space to store all your things – tidying on the go becomes much easier when there are accessible spaces for your items. While you certainly don’t need to buy a whole new collection of storage boxes, you may benefit from maximizing your existing storage. Perhaps one of the more unusual ‘rules’, this technique has some interesting benefits. The KonMari Method outlines folding clothes and standing them upright. In this way, the clothes will have less wrinkles, you’ll have more space, and you’ll be able to see all your clothes more easily. 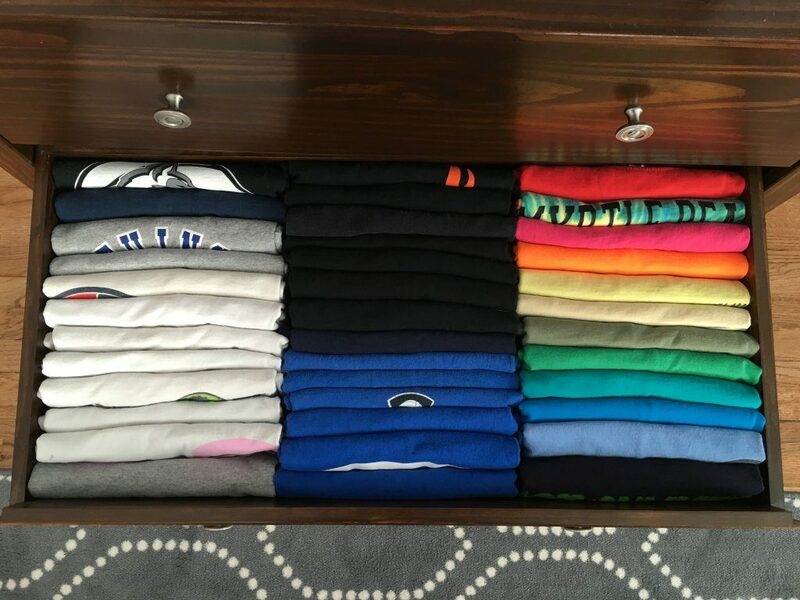 Look how glorious this drawer of t-shirts looks from ProductiveAndPretty.com! It’s easy to find tips online showing you how to fold different kinds of clothes. I recommend this site for lots of lovely folding infographics. Now this sounds like something you can get behind, right? If you follow the suggestions outlined above, tidying should become a special event that happens occasionally, rather than a regular chore that weighs you down each day. It should become much easier to put everything away once used (even with kids!) As you begin to appreciate the joy that comes with less unnecessary items, you will have an easier time of letting go of those things that don’t bring you joy. As always, if you feel overwhelmed at the thought of decluttering your whole home, then call me for a consultation – it’s always free! I’ve helped people declutter their homes from the other side of the country by sharing specific strategies to help them tackle this often overwhelming task. Just enter your details here and I’ll be in touch.